The fashion world is once again mourning another unexpected death. The death of the designer Kate Spade, 55, was a suicide, according to all the evidence collected by the New York police. The body of the creator has been found in her apartment in New York, in the luxurious area of Park Avenue. The body has been found by the staff that is responsible for the housework at 10:20 (local time). The creator had a 13-year-old daughter, Frances Beatrix, to whom the note found on the bed in the master bedroom next to the designer's body is addressed, as revealed by TMZ. The message is short and blunt: "Bea, I've always loved you, this is not your fault, ask dad!" This suggests that Spade suffered from depression because her husband had asked for a divorce. The death comes a year after Spade managed to amass a fortune with the sale of her company to Coach for 2,400 million euros and has brought to light the testimony of a sister of the designer who says she had psychological problems. The apparent suicide of the creator has once again highlighted the strange relationship that sometimes exists between professional success and personal development -with the case of Avicii as the latest paradigm- and the pressures that the industry subjects to its successful products or people. 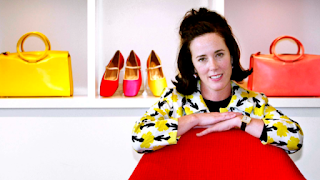 Fashion designer Kate Spade was found dead Tuesday in her bedroom in the luxurious apartment where she lived on Park Avenue in New York. The lifeless body of the woman was found by the housekeeper of the property, who told the authorities that she discovered Spade hanged with a red scarf tied to the door of a closet. The TMZ portal ensures that the head of the household came to touch the body of the designer, who was cold. Then he ran down the stairs to ask for help. The person in charge of the maintenance of the building was the one who picked up the body. Detective chief of the New York Police Department, Dermot Shea, has assured local media that the content of the note, the state of the apartment and the comments of the witnesses point to an "apparent suicide." Missing the forensic exam to close the cause of death. The family says the designer suffered from a mental illness for which she did not want to receive treatment, according to The Daily Mail. "We are devastated by today's tragedy," Kate's family said in a statement released by The Daily News who asks that their privacy be respected in this "difficult moment". According to Reta Saffo, sister of the designer, the death has not been "totally unexpected" due to the mental problems suffered by her relative. "It's true, she was always surrounded by people, but she never received adequate attention for what I thought was a bipolar disorder," she said. In addition, she claims that Kate Spade recently asked her to make an exception to her rule of not going to funerals and going to hers. The reactions have been many, but two especially significant. Diane Von Furstenberg and Steven Kolb, co-chairs of the Council of Fashion Designers of the United States (CFDA), affirmed that the organization is "devastated" and highlighted the "impact" in Spade's US fashion, describing her as "a great talent" " "We want to honor her life and her great contribution to the fashion business and express our deepest condolences to the family," they added in a joint statement. Spade's clothing and accessories are among the favorites of many familiar faces, such as the actresses Anna Kendrick, Lucy Hale, Leighton Meester or Isla Fisher. It is also one of the favorite brands of the Duchess of Cambridge and her sister, Pippa. Born in Kansas City, Missouri, by the name of Kate Brosnahan (December 24, 1962), Kate Spade began her career in the fashion world at the Mademoiselle department store in New York. There she met Andy Spade (brother of actor David Spade), with whom she launched her company Kate Spade Handbags in 1993 after noting that there were no bags of the features she was looking for in the market. The company opened its first store in New York in 1996 and now has more than 300 branches worldwide. She had a degree in journalism from the University of Arkansas. She had only one daughter Frances Beatrix, 13 years old. In 1999, Kate and Andy Spade promoted the male brand Jack Spade. That same year, the Neiman Marcus Group acquired 56% of Kate Spade New York and in 2006 the Spade marriage sold the rest of its shares. Subsequently, Neiman Marcus sold the brand to Fifth & Pacific, then called Liz Claiborne. In May 2017, the luxury accessories company Coach announced the acquisition of the company Kate Spade for 2,400 million dollars. However, in 2016 she had launched the Frances Valentine brand, in honor of his daughter. During her years as a designer, Spade created her own universe. The main element that characterizes the firm Kate Spade since its inception is the use of color. The designer did not focus on combining neutral colors or launch discrete product lines, but quite the opposite. The hallmark of the firm was the bright colors, the fluorescent tones and the brightness. With each collection, Spade forged her own style, first through her bags and then with the expansion of her product line, which could be easily identified by its particular design. The combination of patterns can become one of the most difficult parts to create style. For Kate Spade, however, it was just fun and with each collection she experimented with the combination of prints of different motifs and that included all kinds of colors. Among them were popularly known as polka dots, stripes and others with drawings of animals that dyed from clothes to accessories such as mobile covers or cushions. For the designer, there were no limits to combining colors or patterns and her main objective was to fill color with everything she offered. Unlike most industry designers, Kate Spade made her way into the world of journalism. After going through college, she moved to New York City where she worked for Mademoiselle magazine as a fashion editor. Her years at the head of the publication gave her a knowledge of the sector that later helped her to create her first designs and found her signature of the same name and in which she was able to contribute her personal vision of fashion.